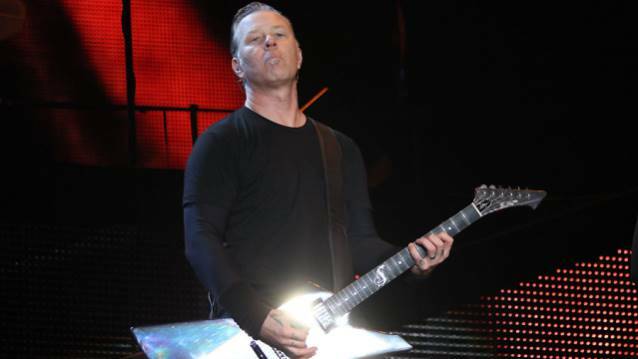 METALLICA debuted a brand new song called "The Lords Of Summer" on Sunday night (March 16) during the opening show of the band's South American tour in Bogota, Colombia. As promised, the band played a nearly all-request set, with 17 songs chosen online by fans prior to the gig and the last slot filled by the new track. A 10-camera fan-filmed mix of the "The Lords Of Summer" performance from Bogota can be seen below. Drummer Lars Ulrich told Rolling Stone that the new song "is fairly representative of where our creative headspace is at right now. It's one of those things that's like, 'Here, we're writing and we're creating.'" Guitarist Kirk Hammett told The Pulse Of Radio that coming up with music is not a problem for the band. "We're a band that never has a shortage of ideas," he said. "You know, you hear about these bands that are like, oh, they're sitting in the studio and they don't have any songs, what are they gonna do? That's not METALLICA. METALLICA's problem is the total opposite: we have too many ideas, which ones are we gonna use. And so that's pretty much how it stands with us." Ulrich cautioned, however, that "The Lords Of Summer" may not even end up on METALLICA's next album at all, or at least not in its current form. He explained, "We did the same thing when we went out and played a bunch of dates in 2006. We were writing and played two different new songs over the course of that summer, and none of them made the record (2008's 'Death Magnetic')." The Metallica By Request tour will hit Europe this summer, with a single North American date confirmed in Montreal, as the band continues working on its 10th studio album. The rest of METALLICA's "by request" show in Bogota featured such "rarities" as "Master Of Puppets", "Welcome Home (Sanitarium)", "Sad But True", "Fade To Black", "One" and "Enter Sandman".